If you’re like me who has gotten tired of the usual fitness activities like yoga, cycling, and jogging. Then why not try hiking? 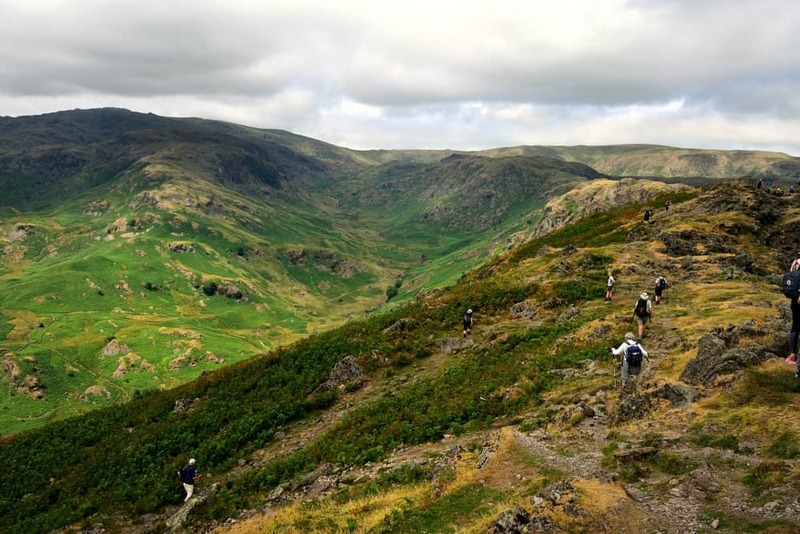 Hiking is more than just a fitness activity for your body. It’s actually a total workout even for the mind. There’s more to hiking than meets the eye, and if you want to be part of this fitness trend, there are a few things to prepare — starting with the right footwear. 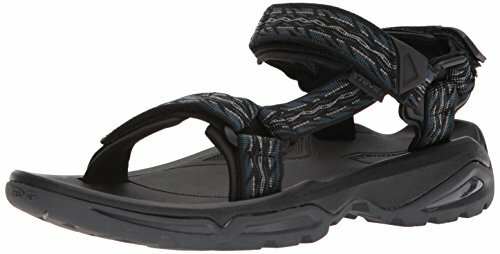 While a lot of hikers, beginners or pros, would recommend hiking shoes, I highly recommend hiking sandals. Before I give you a detailed review of the best hiking sandals I’ve tried, here’s all you need to know about the what’s, the ifs, the how’s, and the why’s on hiking footgear. Other Recommended Hiking Sandals Today! Hiking sandals are now considered as the go-to and must-have item when going hiking or when participating in any sport that’s held outdoors. It mostly has an open-toe construction which makes it highly airy and breathable. This feature makes hiking sandals suitable for use in warm weather conditions such as in the summer. How Do These Compare to Boots or Shoes in Hiking? At first glance, you can easily tell the main difference between a hiking sandal to shoes and boots. For one, hiking sandals are more open concerning design. When it comes to hiking, using an open-designed footgear can be a little tricky. There is no ankle support in sandals that would keep your feet from slipping when hiking through high lands and inclined terrains. Hiking sandals also come with simple strapping systems which might be enough as is, but still quite less safe compared to the overall protection of closed footgear like the best cycling shoes or boots. However, newer designs of hiking sandals already make up for most of its disadvantages. One of the most obvious advantages of using hiking sandals is that it can provide more ventilation compared to shoes and boots. It is specially designed to achieve utmost comfort and coolness, which is excellent during hiking in dry and hot conditions. Whether worn or packed inside the bag, hiking sandals are lighter compared to hiking shoes and boots. They are designed to be small and easy to take around wherever you go. Plus, because it is lightweight, it’s also more comfortable to use especially when hiking for long hours. Aside from being lightweight and airy, hiking sandals are built with several technical features. It means that hiking sandals can be used in various hiking conditions. Add that to its lightweight build, and you have an all-around footgear. It can be a total pain when crossing wet or watery trails using shoes and boots. Though some footwear is water repellent, some aren’t as repellent as they claim to be and still absorb a lot of water. This can make it difficult and lengthy to dry. Try using hiking sandals in crossing rivers and streams – it certainly won’t be an issue anymore. Sandals are quick-drying. Plus, a good hiking sandal can keep you protected and your feet dry and well ventilated in a long day hike. Forget the fuss of sweaty socks when hiking during the summer. What to Look for in Hiking Boots? Choosing hiking boots is like a matchmaking process. It has to be in-sync of where and how rugged you hike. Also, they should be a perfect fit. If you’re still adamant about choosing sandals over shoes for hiking, I’ve listed down a few things you should look for when buying hiking boots. There are different types of hiking boots, and they have different purposes as well. These are day hiking boots, hiking shoes, and backpacking boots. It’s best to find out exactly what kind of hike you’ll be venturing on so that you’ll be well prepared. The materials used to make a boot impact its weight, durability, breathability, and resistance to water as well as wear and tear. Hiking boot uppers can be made from full-grain leather, split-grain leather, nubuck leather, waterproof membranes, and synthetic materials like synthetic leather, nylon, and polyester. The midsole of a hiking boot provides its cushioning which protects the feet from the shock. It also determines how stiff a boot can be. Hiking boot midsoles can either be polyurethane or EVA. Polyurethane makes more durable and firmer midsoles which makes it ideal for mountaineering and backpacking boots. EVA midsoles, on the other hand, are lighter and cushier. The internal support of a hiking booth can be a shank or a plate or both. They act as support for the feet from getting bruised due to uneven rocks. Internal supports are usually placed in between the outsole and midsole of the boot. All hiking boots use rubber outsoles, but sometimes carbon is added to harden the sole. When choosing outsoles, it is important to consider the lug patterns and the heel brake. The lug pattern serves as the bumps that create traction on the outsole. Lugs that are widely spaced offer the best traction. Hiking boots should be able to snug around the feet perfectly while still giving enough room for the toes to wiggle. Consider whether you plan to wear socks or not in choosing the size of the hiking boots. Do You Have to Wear Hiking Boots? Again, what you choose to wear during a hike mainly depends on your preference. Hiking shoes, boots, and sandals have their advantages and drawbacks. However, if you want to be more flexible and comfortable in your all-day hiking, you can opt to wear an excellent quality hiking sandal instead of boots. There are a lot of hiking sandals that would give you the protection that you want. Not to mention, they are the most lightweight and most flexible footgear you can find. There’s no need to wear bulky and heavy boots when you hike anymore. What Are the Best Hiking Sandals? 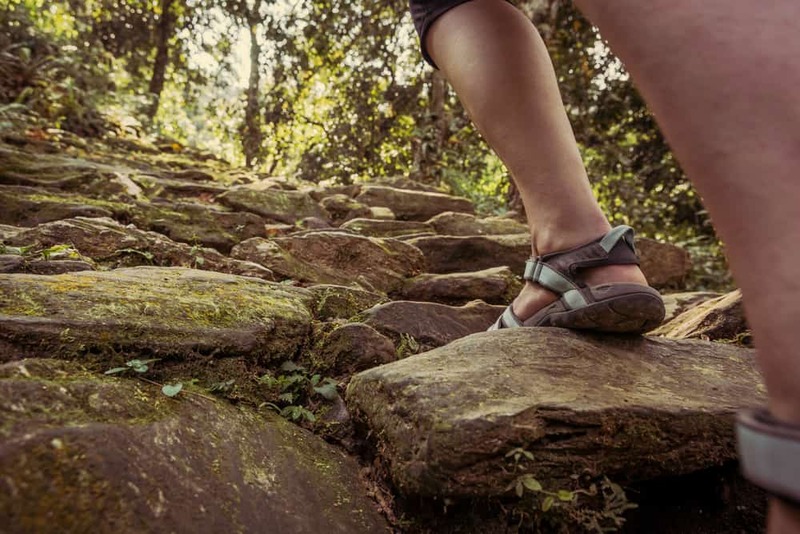 Finding the best sandals for hiking instead of simply using what is readily available is an investment in your hiking experience as well as your safety. The ideal footgear in a hike can protect you from any possible injuries while on the trail. There is quite a range of factors you have to consider when buying hiking sandals. Here are some factors I find vital when choosing sandals for a hike. When it comes to any footgear, size is critical, and the same goes when choosing hiking sandals. 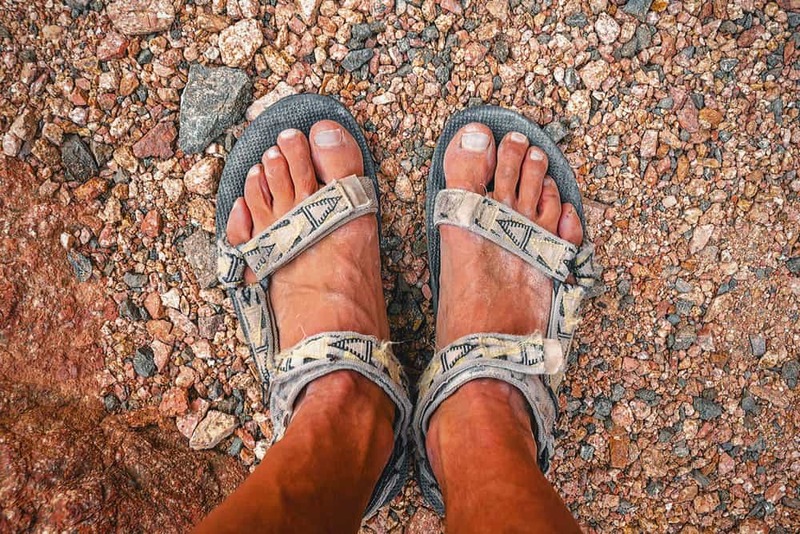 Wearing a pair of sandals that have a size too big leads to an unstable gait, and in turn, could lead to injuries such as slipping or sliding off the trail. Much like life, hiking has a lot of obstacles. You might find yourself having to tread in shallow waters, and there are also times when it suddenly rains on a sunny day. In such cases, a waterproof hiking sandal would be quite useful. It keeps you going even on a wet and slippery path. When choosing hiking sandals, there are two basic choices in terms of its design: open-toe or closed-toe construction. Open-toe sandals are significantly lighter and simpler in build. It provides excellent ventilation which makes it ideal for use in hot and sunny conditions. They are also easy to dry when you have to walk along a watery trail or when it rains. However, it won’t give a lot of protection, especially at the forefront. Closed-toe design, on the other hand, has a lot of protection to offer against obstacles like sticks, branches, and rocks. However, with their extra component, this type of hiking sandal can be a little heavier. The additional panels of cloth and exterior component also make it more vulnerable to tearing and breaking down compared to open-toe with simple designs. Choosing between open-toe and closed-toe design hiking sandals will be based on your preference as each one has its advantages and drawbacks. No one wants to go trekking and hiking wearing heavy footgear. That would take too much energy for the wrong cause. When choosing a hiking sandal, lightness is important especially for comfort. Hiking sandals rely on the straps to stay attached to the foot. In this case, choose a hiking sandal that comes with straps made from the high-quality and sturdy material. Shock resistance, while might not be required, is worth considering especially when planning to hike in hard and challenging terrains. 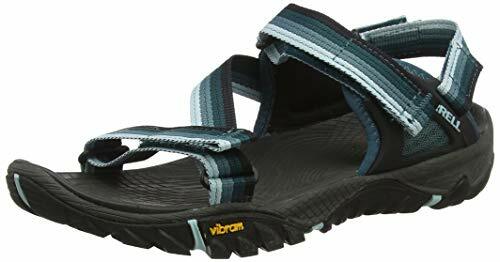 Most hiking and trekking sandals come with excellent arch support. It is one of the factors that make walking in trails comfortable. When it’s well-cushioned, it’s softer on the skin and won’t cause any chafing. Hiking sandals have to have sturdy soles. There are a lot of obstacles on a trail from rocks in various shapes and sharpness to sticks and branches. A sole that is resilient to even the harshest trail conditions will keep the feet protected. The Teva Terra Fi 4 is a multi-sport hiking sandal offered for both men and women. It has now a newer version that includes several additional features. The new Terra Fi 4 now comes with a molded midsole to provide the best cushioning in a hiking sandal. While there are lesser grooves in the top sole, it can still effectively function as underfoot water drainage. The Teva Terra Fi 4 features the Spider Original outsole. It is equipped with a non-slip rubber compound that can excellently work with both indoor and outdoor conditions without compromising the sandal’s grip at the very least. The design of the outsole for the Terra Fi 4 is also specifically made to channel the water out, effectively preventing any fall or slip. What makes the Teva Terra Fi 4 excellent when it comes to cushioning and stability is its PU midsole. In addition to that, it also features the Shoc Pad technology in the heel. This technology combines EVA and PU, making it a unique unit for hiking sandals. Plus, this technology enables even distribution of pressure on the entire footbed, stirring away from putting all the impact on the heel. The nylon shank of this multi-sport sandal also helps in supporting and stabilizing the foot especially when it comes to bumpy trails. It packs in foot support but is still flexible, allowing the natural foot movements. This component helps reduce foot fatigue by easing the stress from the foot arches. The Teva Terra Fi 4 also features Microban, a zinc-based and antimicrobial technology which is embedded at both the mid and top soles with the main purpose of fighting mold and bacteria growth. It helps eliminate stains as well as odor, keeping the foot and sandal fresh at all times. The great thing is that the Microban is already included as a component during manufacturing. It means that this additive will last as long as the sandals last. The Terra Fi 4 features a polyester webbing upper that has a fast-drying ability which makes the multi-sport sandal durable and lightweight at the same time. In addition, the polyester webbing is also a robust material, making the Terra Fi 4 an excellent choice for use in various outdoor conditions. Thanks to its choice of high-quality materials, the Terra Fi 4 doesn’t stretch when wet as it doesn’t absorb water. It also features abrasion resistance to make it less vulnerable to heat. The open toe design gives it a breathable system to keep water from filling the footwear. The Terra Fi 4 offers a standard width for both men and women and fits true to its size. It also features an adjustable strap for the utmost customization and ease of use. One of the selling points of the Terra Fi 4 is its sense of comfort because of its cushioned and spongy footbed and padded straps. It even features a fast-drying neoprene guard at the heel to provide support in hotspot trails as well as to secure the hold of the sandal even when wet. When additional warmth and comfort is needed, the Terra Fi 4 also goes well with socks. When it comes to traction, the Terra Fi 4 is on point with its original spider rubber sole. It is designed to be ultra grippy and can provide excellent friction which is useful on tricky trails. It has a firm outsole that can support even when treading on angular rocks. Even at first glance, the Terra Fi 4 already boasts of sturdiness. The outsole material is hard to even with the cushy midsole and footbed. It is made with durable rubber that is fantastic in handling the abuse of treading in various kinds of trails. The heel support also makes the Terra Fi 4 more stable than most. This feature is unique and can’t be found in other hiking sandals. It helps to lock the foot to avoid sliding especially when hiking steep trails. The Terra Fi 4 features Velcro straps that are easy to use and highly adjustable. It has three straps, one circling the heel and two at the top of the foot. These three straps can be adjusted to achieve the most comfortable fit. The Terra Fi 4 is a multi-sport sandal. It can adapt to a different kind of terrain without compromising its comfortability. It can also very well be used in and out of the water. Also, it has a thick sole which makes it a good choice even in rugged terrains, but even with its sturdiness, the sandal remains to be lightweight. The Teva Terra Fi 4 is both stylish and functional, something that can be worn in hiking various trails or for daily use. The Keen Newport H2 is another multi-sport sandal that packs some excellent features. It is made of perfluorinated compound-free or PFC-free materials. PFC is a harmful substance and doesn’t degrade once released in the environment. I love that this pair is lightweight and fast-drying. The Keen Newport H2 is equipped with an outsole that is made with non-marking rubber. It has multi-directional and low-profile lugs, allowing the hiking sandal to bite and hold even in uneven trails, both dry and wet. The outsole of the Newport H2 has also undergone a unique process known as razor siping. It is a process that gives the outsole precise incisions; thus, giving it an ultra-grip when it flexes during maneuvers and transitions. One of the selling points of the Newport H2 is its compression molded EVA midsole. It is the secret that gives this multi-sport sandal its shock absorption feature as well as its great underfoot cushioning and stability even when used on challenging terrains. Its midsole material is not the typical rubber. It has enough amount of flex that can allow every user to tread naturally and with confidence even in the most demanding trails. Moreover, the Newport H2 comes with a TPU shank for the utmost stability. It is an embedded component in the sandal, mainly for providing additional support and flexibility. The Newport H2 also features a Keen-patented insole, the Metatomical footbed that is equipped with a contoured designed to hold the foot in place and provides great arch support. Also, it is specially created to be odor resistant, but more than that, it has a textured surface, preventing any case of slippage. The Keen Newport H2 is among the most lightweight and flexible hiking sandals in the market. It is made with polyester webbing upper that makes it so. The hydrophobic mesh lining also adds to the sandals selling points. It is the component that allows it to easily shed water, making it a good choice for walking through shallow waters. The Keen Newport H2 also comes with a unique addition, the Keen Protect. It is a reinforced rubber cap that serves as the toe bumper of the sandal. This patented toe guard serves as additional forefront protection to avoid toe injuries. The Newport H2 is built for both men and women and are offered in standard width. However, the sandals usually run small, but when it comes to fit, the Newport H2 is good with its quick lacing system. When it comes to comfort, The Newport H2 is on the top list. That is something unexpected in closed-toe designed sandals, but the Newport H2 features excellent instep and toe box material for greater protection against stubbing the toe when treading in rocky rivers and trails. The Neoprene-backed webbing material of the upper portion of the sandal creates a fantastic cushioning in all parts of the sandal to avoid chafing. Neoprene makes the Newport H2 a comfortable footgear, but this material also makes the sandal quick-drying and provides great performance when used in watery trails. The closed cell foam technology in the footbed doesn’t only resist water; it also makes the entire system comfortable and supportive. The stiff rubber outsole of the Newport H2 gives it fantastic traction especially with its sporty lug design that can bite effectively in both dry and wet surfaces. It also boasts an excellent transition from different surfaces. While the sole might feel light and spongy, its grip is quite intense which is a good choice for various types of trails. The Newport H2 looks more like a shoe than a sandal, especially with its closed-toe design. However, this is not a disadvantage since it can give more overall stability. 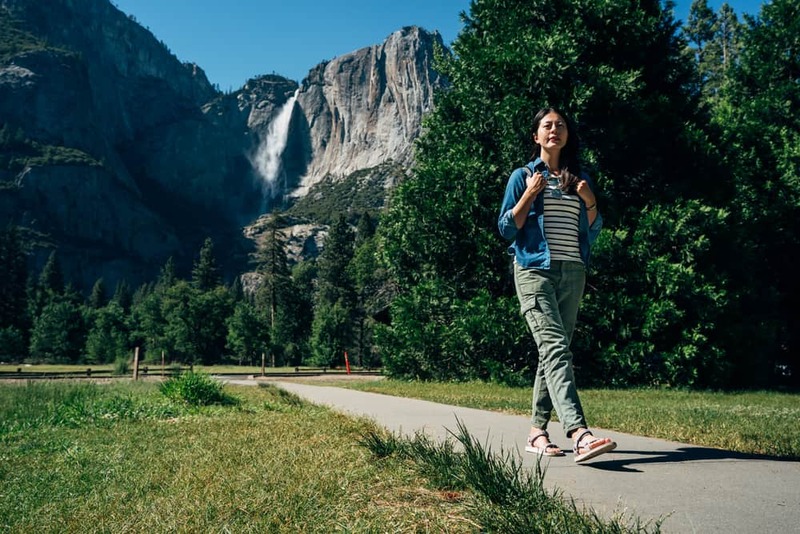 With the combination of its high-quality materials from the stiff and sturdy yet lightweight sole to its toe box reinforced with rubber, the Newport H2 is a trail-ready sandal that is resilient for any hiking abuse. Instead of the typical Velcro straps in most hiking sandals, the Keen Newport H2 features an elastic look that has a cord lock which tightens the sandals like how shoelaces work. I find that this pair is easy to adjust with its straightforward approach, but doesn’t provide that custom and snug fit. However, it is easy to slide in and out of which often doesn’t even require any adjustment. The toe box of the Keen Newport H2 is excellent for protection at the top of the foot which is otherwise unprotected when using open-toe hiking sandals. It is reliable both in and out of the water. The only tricky part about the Newport H2 is when small pebbles and sand find their way in as they can be quite hard to get out. Overall, the Keen Newport H2 is quite as adaptable as most hiking sandals. For those hikes where the trail and the weather can be so unpredictable, I highly recommend the Merrell All Out Blaze Sieve Convertible. Apart from this pair being rugged and durable, it’s built for the wettest environments. If you are planning to spend a whole day of walking, the Merrell All Out Blaze Sieve Convertible can be a great choice, especially with its Vibram soles. This kind of sole is what you can find in most high-end walking shoes and boots. The sole offers a good grip and bite on wet rocks with its hollowed lugs which also adds to its lightness. It is great quality and can give excellent performance in all kinds of trails. The Merrell All Out Blaze Sieve Convertible features a UniFly midsole. 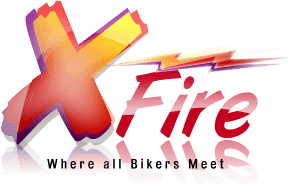 It is excellent in connecting you to the trail while also protecting you enough especially in hard terrains. The upper design of the Merrell All Out Blaze Sieve Convertible is a waterproof PU coated upper made of leather. It also features an elastic heel also made from neoprene that offers ultimate comfort and extra support. Furthermore, this hiking sandal features a no-scuff toecap which adds protection to the forefront. The Merrell All Out Blaze Sieve Convertible comes with a hook and loop closure strap system for a precise fit and easily slide in and out. It also features a removable strap at the ankle for quick conversion. The interior of the Merrell All Out Blaze Sieve Convertible is mostly made of neoprene, and this is quite a comfortable material even on bare skin. The Vibram soles of the Merrell All Out Blaze Sieve Convertible can give excellent and secure traction even when used in shallow water and other wet surfaces. The Merrell All Out Blaze Sieve Convertible is quite stylish. It can be used for short trail hikes as well as for strolling in the city or the beach. Also, it offers great protection and adjustability with both the closure and straps, while still allowing the toes to wiggle free. LOUECHY has designed its Men’s Ponrea Mesh Hiking to be best in terms of breathability even with its closed-toe and shoe-like design. They got creative with the materials to create a shoe that offers great ventilation while still being snug and custom-fit. 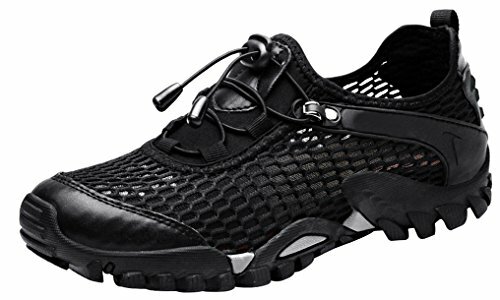 The LOUECHY Men’s Ponrea Mesh Hiking is made to achieve utmost flexibility without compromising its durability, and it shows with the outsole it is built with. It features a completely tractioned rubber sole that is extremely bendable, making it a great choice for use in bumpy and rocky terrains. However, there is a slight disadvantage in the ultra-flexible outsole of the LOUECHY Ponrea Mesh Hiking. Due to its sole’s flexibility, I could still feel the bumps through it. The LOUECHY Ponrea Mesh Hiking provides a very soft insole for enough cushioning and shock absorption. It’s great for hiking for several miles. However, this footgear lacks ankle support and will not be as great for long and multi-day hiking trips. Protection is what the LOUECHY Ponrea is all about. It offers supreme protection from both heel counter and toe bumper. It might not be able to support the ankle like hiking shoes or boots fully, but it comes with several safety features where it is needed most. To make it more breathable and airy, the LOUECHY Ponrea is made with a mesh textile upper with hexagonal aperture, creating a stellar airflow while still being snug and custom fit. The upper materials of the LOUECHY Ponrea Mesh Hiking are soft and can easily snug to the feet. However, there are cases where the sizing can be a little inaccurate. This footgear has a soft insole with super flexible rubber soles. While it’s great to use in plain terrains, it can be a little uncomfortable in rocky trails especially those with angular rocks. The rubber sole is not exactly that thick which made me feel every rock I stepped on. Not enough cushioning can compete with that. When it comes to traction, the LOUECHY Ponrea gives it in tons. While the sole is ultra-flexible, it has an intense bite which is great for various types of terrains. It has a directional pattern which gives it the most traction that can work very well in both dry and wet surfaces. The LOUECHY Ponrea Mesh Hiking has excellent traction. It can bite even in wet terrains. The only downside is that it can be a little uncomfortable walking in uneven terrain. The LOUECHY Ponrea Mesh Hiking comes with laces that are slightly stretchy, making it easier to conform to the feet. Tie it at the end or put it a bungee clip for easy slip in and out. With its stretchy laces, it’s easier and quicker to adjust the tightness to get a custom fit. The Keen Whisper sandal is mainly built for both mobility and comfort especially with its polyester webbing that also comes with hydrophobic lining. In addition, the design also comes with several vent holes to offer extreme breathability during use. The Keen Whisper sandals for women have non-marking outsoles that make it excellent for urban surfaces and rugged terrains. It is a single rubber but is extremely grippy and has lugs in several directions, extending all the way to the forefront zone of the upper. This extension of this design makes it the toe guard of the upper. Since the Keen Whisper sandal boasts of its comfort, I expected a lot when it came to its midsole materials. Luckily, I was not let down. It has a compression-molded midsole that offers not only comfort but also stability and excellent cushioning. It’s not the typical midsole as Keen Whisperer made its thick design, especially at the heel to provide utmost comfort. It also comes with TPU shank acting as extra support designed for stability. TPU is a rubber material that boasts high resilience, resistance to wear and tear, and flexibility. Furthermore, the Keen Whisper also features Metatomical EVA footbed that is not removable and perfectly fitted which makes an overall cushy midsole. It is designed with Cleansport NXT technology that can fight odor. The textured design of the midsole also adds additional underfoot grip. The Keen Whisper features a stitched upper with a combination of hydrophobic mesh and polyester materials. This combination makes it the best of both worlds, offering a washer-friendly, lightweight, and breathable hiking sandal. The numerous vent holes on the upper also give the Keen Whisper sandal extra breathability. The Lace Capture System the Keen Whisper is made with makes a secure-fit and ankle lockdown. It makes lacing up easy, quick, and smooth especially with the elastic speed laces, adjustable locking clip, and the synthetic hook eyelets. At the forefront zone, the Keen Whisper features a Keen-patented extension of its outsole acting as toe guard. It adds an extra protective barrier against toe bumps and other forefront injuries. 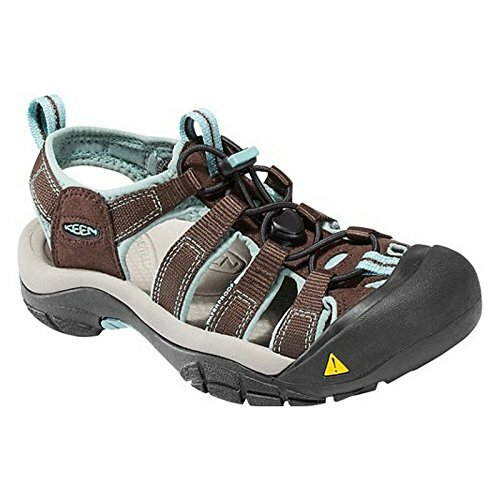 At the heel zone, the Keen Whisper also features a pull tab, making it easy to slip on and off of the sandal. 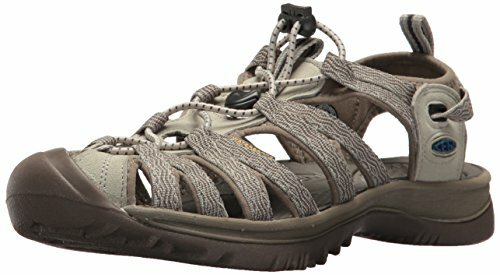 One of the best things about the Keen Whisper sandals for women is that it is true to size designed to fit every female hiker perfectly. It is offered in B-medium width and has both whole and half sizes from 5 to 11. The forefront zone of the Keen Whisper sandal is made spacious to give an ample wiggle space for the toes. It is also custom-fit, especially with its elastic laces closure system. When it comes to comfort, the Keen Whisper is among the top of the line. The CMEVA or the compression molded EVA midsole it comes with makes it ultra-lightweight and flexible along with providing the right amount of support and cushioning for a whole day of hiking. The synthetic mesh webbing the Keen Whisper is made with makes it quick-drying which is great for fast comfort when transitioning from wet to dry trails. The Keen Whisper is made with less aggressive lug pattern than most hiking sandals especially at the forefront, the most important part in the sole, which makes it less sticky. While it can still give considerable traction, it doesn’t beat a lot of the top hiking boots in the market. The Keen Whisper sandal is designed to be a water-specific footgear. It is extremely safe to use on a wet terrain especially with the closed toe design. However, the traction is not exactly top-of-the-line. On good thing I can say is that it can dry out much quicker than other hiking sandals which are great for transitioning from wet to dry terrains. The Keen Whisper sandal is very easy to adjust. It can customize a fit with a single pull on a tab. One pull leads to an equal tension all throughout the straps. The adjustment system of the Keen Whisper is quite good. However, its webbing material sometimes makes it impossible to achieve a custom fit since it couldn’t be adjusted. I found that its lace system simply doesn’t accommodate this issue. Choosing high-quality hiking sandals is not as difficult and tricky as you think it is. 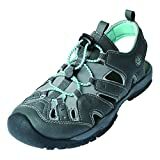 Hopefully, the reviews I’ve listed here will help you a great deal in choosing the best hiking sandals.